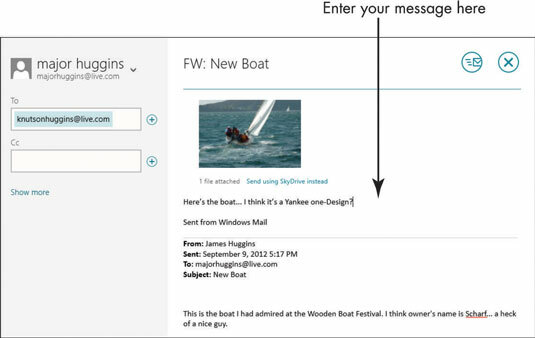 If you receive a Windows Mail e-mail message and want to send a message back, use the Reply feature. You can also use the Forward feature if you want to send an e-mail to someone that you received. Reply: Send the reply to only the author. Reply All: Send a reply to the author as well as to everyone who received the original message. 2In the resulting e-mail form, enter any additional recipient(s) in the To and/or Cc text boxes; to send a blind copy, you can click Show More to display the Bcc field. Type your message in the message window. 3Click the Send button to send the reply. The reply has been sent to the addressee. 4To share an e-mail you receive with others, use the Forward feature. Open the e-mail message that you want to forward in Mail. 6In the message that appears with FW: added to the beginning of the subject line, enter a new recipient(s) in the To and/or Cc and Bcc fields. Enter any message that you want to include in the message window. 7Click Send to forward the message. The message has been sent to the forwarded address.